Fireplaces in 19th century homes ensured that the warmth stayed in the rooms whilst the smoke drifted up and out of the chimney. Although it was the most economical way to heat a house fires created a considerable amount of work for the servants or housewife. The fireplace had to be cleaned and re made on a daily basis and the floorboards and rugs in the rooms had to be scrubbed and polished to ensure that coal dust did not mark them. 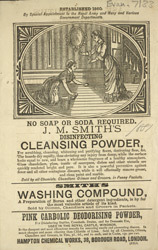 Products like Californian Borax would have been invaluable cleaning agents.